There are very many guides about Fankfurt, but here is a much different one. It mentions only such sights, which are to be achieved immediately by tramway or urban railway. All photographs are shown in their full size, if you klick the left button of your mouse. The Hammering man is located near the Messeturm, next to the bend Festhalle/Messegelände (just the rear car of line 19 is there). You achieve this bigger than life-size sculpture by lines 16 or 17. The photograph shows N-Wagen 827 entering the route directed to Platz der Republik/Hauptbahnhof on the 13th of December 1998. This recently builded edifice is on the run to take over the No.1 place on the hitlist of Frankfurt´s most photographed buildings from The Römer or the Henninger Turm. 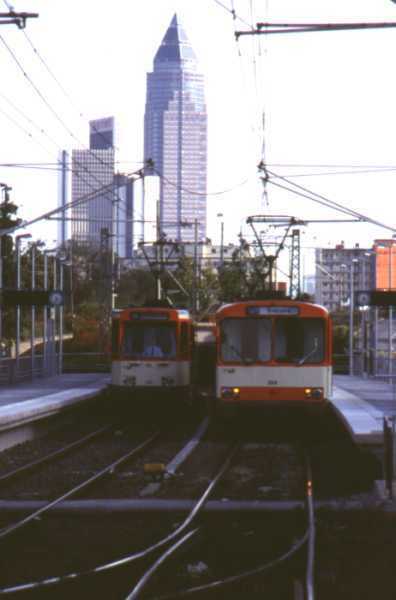 You will reach The Messeturm (Hight: 257 m) by tramway lines 16 or 17, stop "Festhalle/Messegelände". 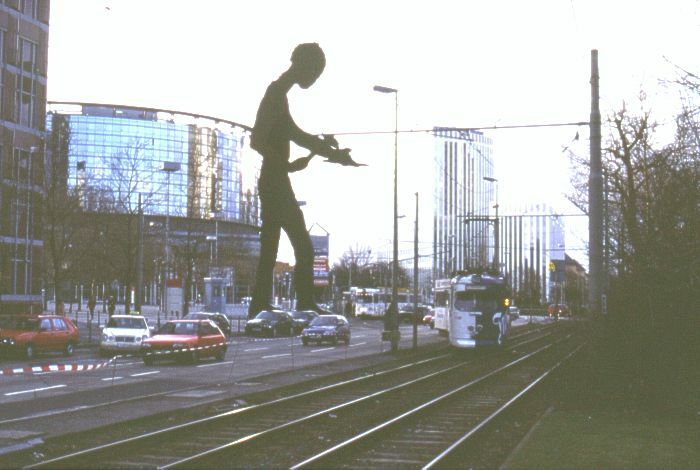 The picture was taken on the 20th of September 1998 in front of the urban railway stop "Industriehof" (lines U6 and U7). This interesting building-fragment is located nearby the Obermainbrücke. To achieve by tramway line no. 14, stop "Hospital zum heiligen Geist". 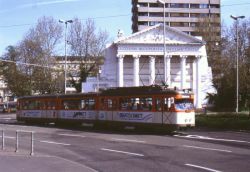 The photograph (showing N-Wagen 809) was taken on the 25.th of April 1999. This building is located right in the heart of Frankfurt´s old town (Braubachstraße). The passage below the attachment between both building tracts is almost classical. See the light building in the background? Half way to the right is your way to the Römer. Line no. 11 or 12 stop "Römer/Paulskirche". 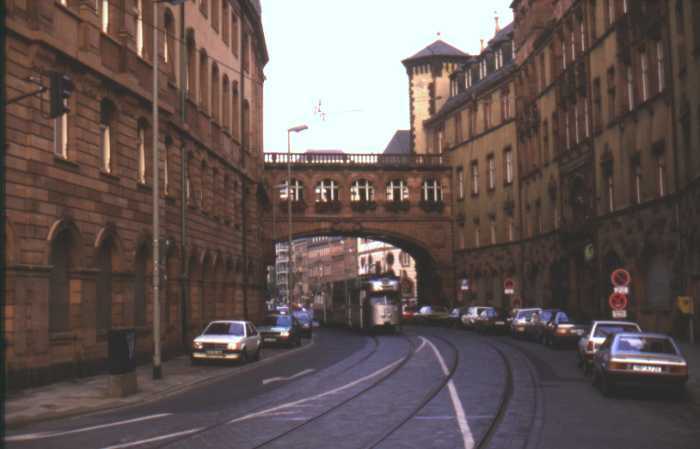 The photograph comes from a time, when more than two lines frequented the Altstadtstrecke. It shows N-Wagen 814 on former line 14 (Fechenheim - Mönchhofstr.) at the 3th. of October 1986. The Schweizer Platz is located right in the middle of the quarter called Sachsenhausen, the "Ebbelweiviertel" in Frankfurt. Several pubs in which you can relish the "Stöffche" (=Ebbelwei) at every season are nearby. 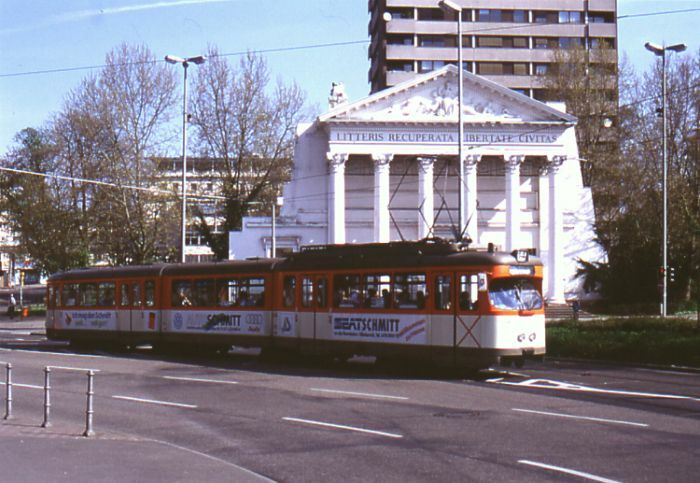 The Schweizer Platz is to be achieved by streetcar no. 15 and 16 or by city-railway U1-U3. 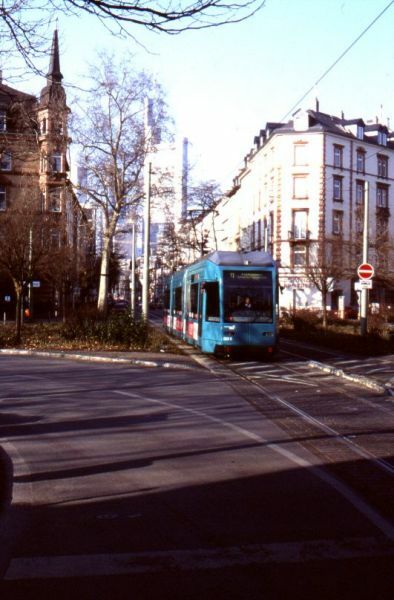 R-Wagen 039 on line 11 is portrayed here, photographed on the 14th of February 1999. Regularly Line 11 goes through Sachsenhausen only once a year - on the shrovetide sunday. LUp 10.04.2005 Many thanks to Hajo Triendl for this translation.